Ex-Rotherham boss Steve Evans believes the Championship club will want to appoint an experienced new manager. Neil Redfearn was sacked after four months in charge and development coach Andy Hughes left the club on Tuesday. Nicky Eaden, who joined Rotherham four days before Redfearn's sacking, has been put in temporary charge. 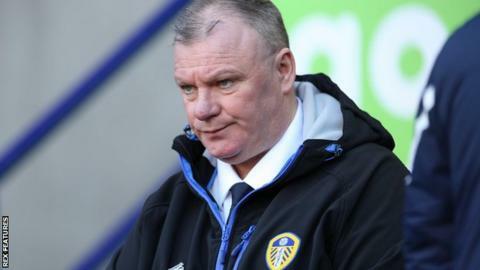 "The Championship is a league for experience and we're finding out now just what that means," Evans, now Leeds head coach, told BBC Radio Sheffield. "Everyone thought that if you follow the success we had at Rotherham in recent years, it would be a difficult task to follow. "That's what never came - the chairman had great loyalty and respect for Neil but you have to back that up with results and that didn't come." Evans led the Millers from League Two to the Championship in consecutive seasons before leaving the club in September. Rotherham have lost their last four league games and are currently 22nd in the Championship. "I see the chairman going for someone who will fight for them and get them enough points to keep them in the Championship," Evans added. "They want someone who may get down because of a result or two but he will come up, get into the trenches and fight."